Cooling Tower Sales and Installation Services in Victoria: Why Choose Us? Home > Blog > Cooling Tower Sales and Installation Services in Victoria: Why Choose Us? 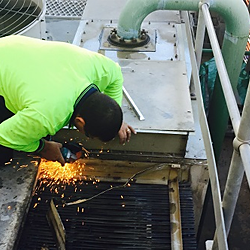 Blog: Welcome to Coolclean, we are provide specialised cooling tower maintenance services for all types of commercial cooling systems and industrial cooling systems. We also carry a full range of spare parts such as fill pack, air intake louvres, drift eliminators, fan motors and fan drives. Our specialist maintenance staff can replace or repair mechanical parts and PVC components, for any make or model of cooling tower. We can also supply parts directly to organisations who have their own maintenance crews. Our highly trained cooling tower technicians will provide you with full reports (with photos) detailing the condition of cooling components and parts, and any maintenance procedures that may be required. Regularly maintaining and servicing your cooling towers not only ensures that they are operating at peak performance, all the time, but will greatly extend their life. In addition to cooling tower maintenance, cleaning and repair, Coolclean also provides new cooling tower sales. As older cooling towers begin to wear down with age, new cooling towers become an attractive alternative, instead of regular costly repairs. For organisations looking for cooling tower sales and installation services in Victoria, there are a few available options, but after a fair comparison, one company stands out as the best choice, offering quality Australian made Fibreflow cooling tower sales and installation. If you are interest in finding a company that offers quality cooling tower sales and installation services in Victoria, Coolclean is the company best suited to install a cooling tower for your organisation. Why is this? Because we offer a quality Australian-made product, have 25 years’ experience behind us, and a team of highly skilled technicians. Coolclean is the official representative for Fibreflow Cooling Towers, fluid coolers and evaporative condensers in Victoria and Tasmania. We’re proud to supply, install and service Fibreflow Cooling Towers, which are 100% Australian owned and made. They offer our clients the very best in HVAC services and value for money. When you choose a Fibreflow cooling tower from Coolclean, you’ll benefit from our knowledge developed over many years, and a quality cooling tower. For information about the benefits of Fibreflow cooling towers visit http://www.coolclean.com.au/our-services/cooling-towers/new-sales-and-installation/ or call us today on 03 8765 9500. Nov 2017: Need Cooling Tower Repairs? Sep 2017: Get ready for summer – Are your Fan Coil Units overdue for a clean? Infographic: Are your cooling tower cleans effective? Sanitisation, Disinfection or Protection: Which is better? What are Air Handling Units? It’s a hot Melbourne summer – is your cooling tower working correctly? Due for a New Cooling Tower? Copyright © 2019 Coolclean, Servicing & Repairs. All Rights Reserved.